Residential and commercial buildings continue to build water features that are unsafe. Specifically, water fountains of Spanish design containing water dishes of different sizes that tier downward in size and empty to a large collection basin have become more and more of a safety concern, especially for children. The primary problem with the assembly of such Mexican fountains is the lack of bonding between the tiers of heavy concrete pieces. The concrete sections also known as pre-cast units are often just stacked upon each other with a water tube connecting the sections. Plumbers putty is utilized to waterproof the sections to avoid water loss, but no true adhesive is used to bond the concrete sections. The obvious problem is that the heavy tower is a time bomb for young children who may climb or play in the water. Children and young teens find the fountain as some type of psychological ladder that needs to be climbed; add to that, a water feature and a recipe for potential disaster is created. What can and should be done? The prehistoric design of such landscape accessories lends itself to catastrophic results. Wrongful death claims are the most severe as head injuries are commonplace with fountains collapses. Benson and Bingham have experienced a variety of accidents from broken legs to crush hands, and the most serious: head injuries. Some fountain weigh in excess of 1,000 pounds. Each tier may weigh in excess of 100 pounds. The fact these are stacked upon each other without some fastening device is an absolute hazard. Bolting the fountain down is the most obvious cure for maintaining the strength and integrity of the fountain. The cost of such precaution is minimal. 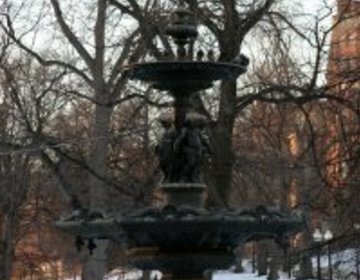 Due to the fact fountains may need maintenance with the connective pipe or the water pump, it is important that the pieces may need to be removed and thus a thin-set based cement may not be a practical fix. Old and decrepit concrete may be brittle and prone to breaking adding another risk to the fountain. A negligence claim can be established using the attractive nuisance doctrine. This doctrine is a protection to children who might wonder upon a safety hazard thinking the hazard is a playground of sorts. Swimming pools, dangerous excavations, abandoned woodsheds; old refrigerators are a few examples of items children may consider exciting or challenging. When an accident occurs, the child’s Age, Training, Education, and Experience will all be considers as factors in determining whether the child was negligent and whether the attractive nuisance doctrine applies. The possessor fails to exercise reasonable care to eliminate the danger or otherwise to protect the children (See Restatement of Torts §339). Children are attracted to water fountains. The curiosity of the water flow, the physical structure challenge coupled with the non-obvious danger of a structure that appears so stable and strong is a misleading danger for the young. If you, or a loved one were victims to such negligence call the experts in premises liability, Benson & Bingham. Benson and Bingham specialize in Water Fountain accidents. Contact us today for a free consultation. Water Fountains can often pose as a danger to children.